Anyone who works around big, heavy concrete slabs should be aware that their lives are in perpetual danger. From start to finish, concrete slabs have the potential to cause severe harm to those around them. Mixing risks. Concrete dust can cause breathing problems. Concrete is composed of small pieces of stone, called aggregate. When these stones are mixed with cement, the tiny particles of aggregate dust can be dispersed into the air and inhaled. Pouring risks. Concrete can be slippery until it dries. If any bit of the wet mixture gets on a worker’s boots or the ground, it can cause the worker to slip and fall. Furthermore, the alkaline properties of wet cement can be caustic. If the cement splashes on the skin and isn’t removed quickly, the chemicals in the mixture can lead to third-degree burns. Drying risks. Concrete slabs can weigh more than 800 pounds and are at risk for tipping, shifting, and falling on those around them. Almost every job that you can have as a construction worker carries a possibility of working with concrete…which ultimately increases your chances of sustaining serious injuries. Workers falling onto concrete slabs. Workers being crushed by slabs falling from cranes or forklifts. Workers getting pinned between concrete slabs. Workers suffering heatstroke while cleaning truck mixer drums. Workers being impaled on rebar sticking out of concrete slabs. Workers getting caught in concrete mixers or covered with concrete. Workers being burned or blinded by concrete chemicals. Workers suffering back injuries from lifting heavy concrete slabs. A few of these accidents are pure chance accidents, and there is nothing that can be done to prevent them. However, the much more common scenario is that these incidents—and the injuries that result—are the direct result of someone else’s negligence. Hazard communication. 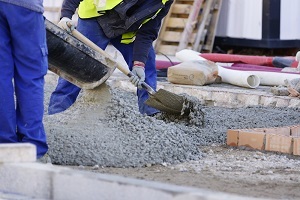 In addition to warning their employees of the potential risks, employers must also provide adequate warning signs and guards when cement hazards are present on the construction site. Respiratory protection. Employers must provide their workers with face masks or ventilators when there is a threat of cement-related air pollution on site. Ear protection. Mixing, pouring, cutting, and drilling into concrete can be noisy, and cause permanent hearing loss or ear damage to those around it. Therefore, employers are required to provide adequate ear protection—such as ear plugs and noise-canceling headphones—during demolition and construction. Skin protection. To avoid burns from contact with wet concrete and cement, employers must supply workers with alkali-resistant gloves and coveralls, as well as provide access to emergency washing stations. Unfortunately, despite the safety mandates from OSHA, many employers fail to take all the necessary precautionary steps to protect their employees. While the liability of a workplace accident may vary depending on the circumstances, the general rule is that if someone else’s negligence—including that of your employer or co-worker—caused your injury, you deserve compensation. For more information about your legal rights following a concrete disaster, call Steve Lee, the experienced work accident lawyer, at 800-232-3711. We’ll be happy to schedule your FREE consultation and help you cement a strong personal injury or workers’ compensation claim. What is the most common type of accident in the construction industry?